What is in your 30 Day Meal Plan? A gorgeous printable 30 Day Meal Plan. Printable one page list of meal ideas. 15 pages containing 30 breakfast and dinner ideas. These are tasty and delicious Instant Pot meal ideas. a grocery shopping list and tip of the day. You are purchasing a PDF of a 30 Day Instant Pot Meal Plan. This is a fantastic, affordable and easy to use 30 Day Meal Plan. 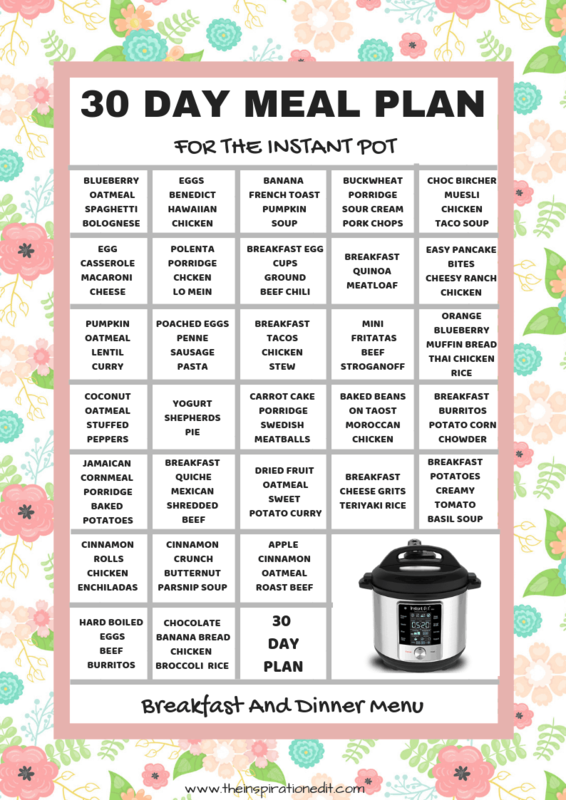 For only $2 you can download this printable and get started with 60 amazing Instant Pot meal ideas! This meal plan is full of tasty breakfast and dinner recipes. Whether you’re looking for a tasty porridge recipe or you fancy eggs for breakfast, there are 30 unique and easy instant pot breakfast recipes to start the day right. The menu also has a selection of 30 evening meals which you will love. There is a large variety covering dishes that have proven popular across the internet. You can follow the plan or mix and match. The choice is yours. Download your 30 day Instant pot meal plan today! What are you waiting for? What is in your 30 Day Menu Plan? 15 pages of breakfast and dinner ideas.